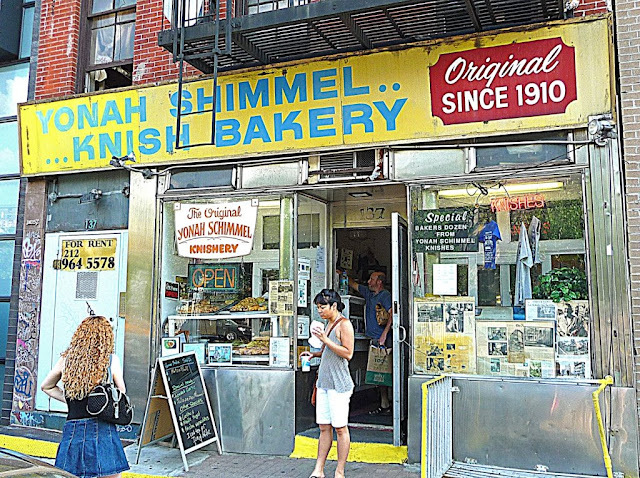 I have no idea what a knish or kuegel is but that bakery looks super amazing! Love the atmosphere of it. I watch Bourdain last night but he was in DC, missed the Manhattan episode! I'm with Tanya here. I don't know anything about knish or kuegel, but I want one! That makes three of us but I'll eat about anything. Looks like some kind of cinnamon rolls and they're hge! Oh yum .. is this near Katz Deli? I'm sorry I missed Anthony's Manhattan episode. This looks like a place I need to visit asap. I love the entire shop as well as how the food is displayed. Perfect! Mmm... Schimmel's Knishes ... since moving to NJ, I really miss the yummy goodness. Can't see how he was drinking a Guinness since McSorley's only serves two ales (dark and light, their own brew). Is Bourdain a smuggler?! Oh, I love this place. Wonder how much the rent is for the place next door? Ah, I guess since I wrote Guinness instead of dark ale, that means he wasn't really there...clearly that's totally irrelevant to the point. Ah, YES!!! That's what I am talking about!! Remember? I grumbled last time. This is what I wanted to see: this old charm interior. You forgot the crazy little tables but that is ok. I'm absolving you. Oh, man. Now this hurts! They had the best knishes on the planet. This is what you have to give up when you leave NYC for other places. There's nothing like Yonah Shimmel's. My dad, who grew up in the 'hood when YS's was a new store, told me all about it. And Katz's. But I wonder if the Shimmel's still own or run it. Sigh. It's almost midnight here in Oakland, a continent away, and I'm craving a Yonah Shimmel Knish right now. Cinnamon rolls? Now my head hurts. Born under a rock here. But I'll eat anything. He wasn't in McSorley's, he was in Sophie's on 5th btwn A and B.
Oh, I remember that place when I was visiting NY a couple of years ago. A friend took us there and the Knish were so yummy! Thanks for reminding me! Don't know what a knish or a kugel is?? ?born under a rock or somethinmg? ?Reminds me of the NY haters of way back. Google it if necessary! gotcha. it looked like McSorleys from the outside and there was a sign that said McSorleys in the window too, so that must've confused me! ROFL, that's alright...Most of the ones I know are a-ok! Love the photo, Having grown up a child in my Fathers stores I just love the old time look. That wooden display case is wonderful. OMG,, he ships out? Does he do bagels, too? They also serve an incredibly delicious borscht, in a cup, like a drink. It's my favorite.